ActionNetwork.com currently posts the under and over line on this year’s Rams Patriots Super Bowl game at 57 points. By kickoff many Americans will know that number and perhaps even made a wager related to it. Here is a number no one will be wagering on and arguably should know – the average student loan debt for the Class of 2017? According Student Loan Hero, is student loan debt under or over $40,000? If you guessed under, you are correct, but barely. Student Loan Hero reports the average student loan debt for the Class of 2017 was $39,400, up six percent from 2016. According to LendEDU the average cost of hosting a Super Bowl party is $207.16. 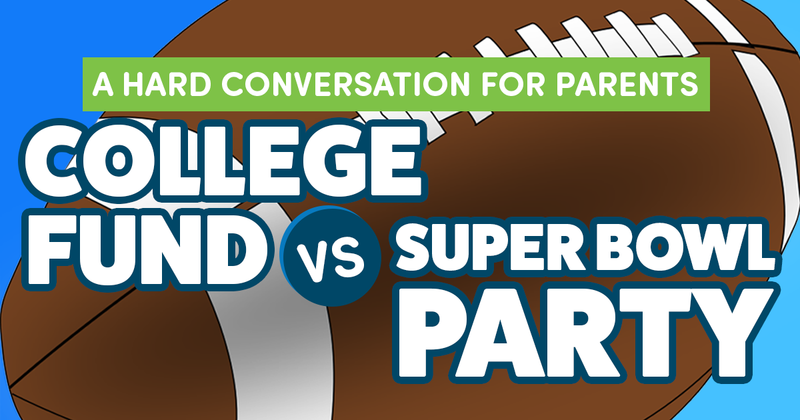 It may be hard to explain to a child how mom and dad have money to host a Super Bowl party but not have money to deposit to a college savings fund, like a 529. Perhaps this one reason why many surveys indicate parents avoid talking to and teaching kids about money. Small, daily, repetitive decisions have compounding and consequential impact over extended periods of time. So, big or small, make your choices count! I grew up in a 7 person, two bedroom, one bath, one TV house without something called “discretionary income.” What that meant was the use of income in our house was prioritized to the penny. It also meant decisions on how to prioritize it were made by those with the most experience managing it. In other words, not kids. Parents of that era were also faced with difficult conversations. Many, it seemed, were up to the task. That has become crystal clear with age and maturity. “No, you can’t have that.” Or, “yes, you can have that, IF, you work to pay for it.” Those were common expressions. Sammy’s vision and objective are to develop generations of children who possess and practice great habits, who become self sufficient, and capable of making their big dreams come true! Dream Big Mission 1 is to have one million kids own, read, and color Sammy’s Big Dream by the end of 2020! Click to discover more about Sammy’s Dream Big vision, missions and initiatives. Executing Dream Big Reads is one of Sammy’s primary strategies to achieve his first mission. Dream Big Reads can be conducted in classrooms, schools, youth clubs, and/or throughout school districts, cities, states, etc. Here are some examples. Bring Sammy resources to the kids and families in your community or network. Start with Sammy’s two strategy and a pilot test.